I find that the weather was always a bit of an obsession in Canada, at least in my neck of the woods (south-western Ontario). In the winter, if it snowed a lot or was very cold, it'd be front page news, in the summer, if it rained a lot or was hot, it’d be front page new. 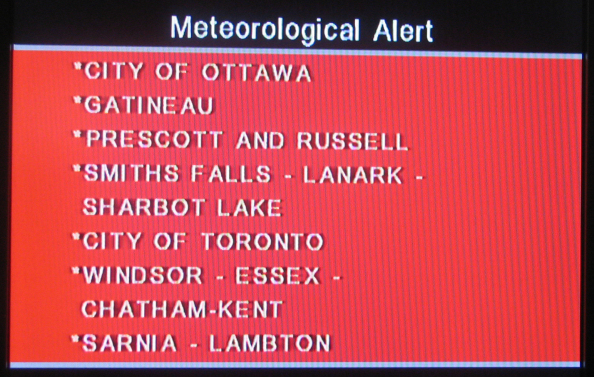 At my parents’ house, we used to have The Weather Network on the TV for hours on end. In the kitchen it would be on as background noise whenever we were making dinner, as it was far more relaxing (some would argue informative as well) than CNN. 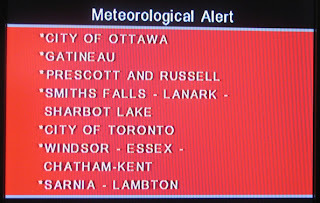 I always used to love the severe weather alerts that would come up once in a while, usually in the spring or summer at the height of the tornado season. We used to pride ourselves in being in the Tornado belt. It'd give me a tingly sensation in my spine, like if we were close to the end of the world whenever the warning tone would sound and one of those blood red severe weather alerts would come up. 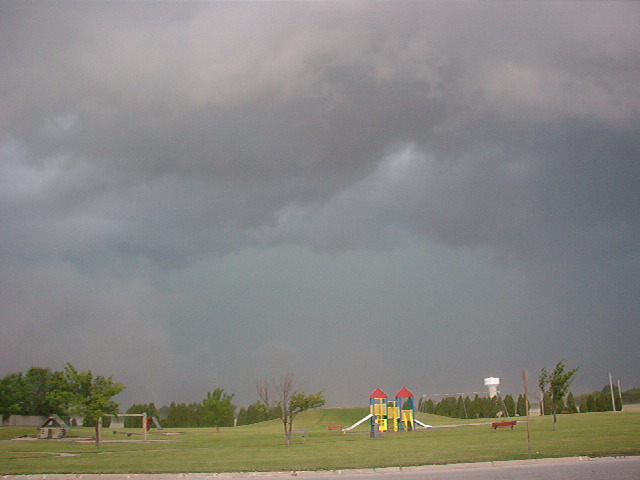 You could almost feel the electricity in the air when a tornado or severe thunderstorm warning was announced. And when the summer thundershowers would pass, as you'd step outside you would be greeted with clear skies and the sound of dripping water, with flashes of lightning and the low rumble of thunder in the distance. Later on you'd have a breathtaking sunset in hues of violet and red. Though summer also brings allergy alerts and UV warnings. In the winter, seeing the Arctic front coming down was always a bit depressing, that spelled cold snaps and wind chill warnings and having to plug in the block heater. When I moved to Portugal, invariably any phone call with my parents would include a weather report, including local humidity and wind chill. They would, of course, expect the same from me. Unfortunately, Portugal's weather isn't very temperamental (ha!). I can count on one hand the number of thunderstorms I've experienced here, and have only seen snow once, most of the year the weather is either sunny or rainy. We may not talk about anything else, but we'd always talk about the weather. Good post. I learn something tougher on completely different blogs everyday. content material on my weblog whether you don’t mind. Natually I’ll give you a link on your net blog. Thanks for sharing. certainly you're going to a well-known blogger should you aren't already ;) Cheers! producing such good, trustworthy, informative and even cool tips on the topic to Julie. have been puzzling over if your web host is OK? [b][url=http://www.fuseflow.com/web/]コーチ 激安通販[/url][/b], [b][url=http://www.mogotrack.com/fashion.htm]ヴィトン バッグ[/url][/b], [b][url=http://www.caringhandspetclinic.com/content/]ロエベ トート[/url][/b], [b][url=http://www.madhavanconsulting.com/]ジミーチュウ スニーカー[/url][/b] ([b][url=http://www.thamesharbour.com/]ロエベ 財布 通販[/url][/b]). [b][url=http://www.thamesharbour.com/]ロエベ バッグ コピー[/url][/b], [b][url=http://www.ycua.org/facebook.htm]コーチ バッグ 通販[/url][/b], [b][url=http://www.challengerdeep.ca/libraries/]ヴィヴィアン 手袋[/url][/b], [b][url=http://www.kurtcomics.com/backup/]Prada バッグ[/url][/b] ([b][url=http://www.miiequipment.com/literature/]ニューバランス 574[/url][/b]). [b][url=http://www.leonardocosta.com/gasstos.asp]コーチ アウトレット 通販 [/url][/b], [b][url=http://www.deptris.com/wp-content/chanel-bags-online.asp]シャネル 通販 公式[/url][/b], [b][url=http://microinterconnects.com/cablebuilder/mic/]ニューバランス　スニーカー 新作[/url][/b], [b][url=http://ymada.com/]ロエベ 財布 メンズ[/url][/b] ([b][url=http://www.islandlawfirm.com/footer/]プラダ バッグ 新作[/url][/b]). [b][url=http://www.kaoudrug.com/]プラダ 通販[/url][/b], [b][url=http://www.costruvendo.com/cv/]ルイヴィトン エピ[/url][/b], [b][url=http://gottproperties.com/]Chanel[/url][/b], [b][url=http://www.patrickchristine.com/fashion.htm]シャネル 激安 コピー[/url][/b] ([b][url=http://www.ablefuels.co.uk/secure/]ジミーチュウ[/url][/b]).